The Geese and Fountain ‘Light Lunch’ menu is available Monday to Saturday, 12 until 3pm, in addition to our pub classics menu. Geese & Fountain crisps or a small cup of today’s soup. 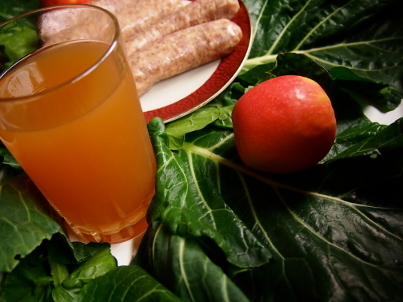 October is the perfect time of year to celebrate two of the countryside’s greatest things – cider and sausages! We’ll have a huge variety of special ciders and perries from local producers and even a few from further afield, together with a sausage menu of some of our favourite sausages produced by local butchers. Special dishes on the menu including ‘toad in the hole’, sausage casserole and, of course, sausages in buns, sausages on sticks and sausage sandwiches. The second Geese and Fountain Traditional Cider and Sausage Festival will take place over the last weekend in October 2017. From Thursday 26th October to Sunday 29th October, you can choose from over twenty different traditional ciders and 25 locally produced sausages from the best butchers in the region. Whether your tastes run to scrumpy and traditional pork sausages, or perry and a touch of venison or beef, you’ll find lots to get excited about. Lots of local cider makers will be featured, but so will some of the best specialist cider makers in the UK, including Waulkmill Cider from Scotland, and a keeved sweet cider from Pilton in Somerset. Keeving is a special process whereby the fermentation is deliberately interfered with to leave a much higher residual sweetness in the cider, and is the only way to create a naturally sweet cider without the addition of juice or sugars after fermentation. If you’ve not tried keeved cider before, you need to make a point of having a taste. This will be a showcase for some of the best sausage makers in the region. Locally farmed meat, hand made sausages, delicious flavours. Come down and pick your favourite. Sausages available lunch and dinner from Thursday 26th October until Sunday 29th. In a bun, in a casserole, in a toad in the hole, or just ten sausages in a sausage platter. However you like your sausages, this is an event you won’t want to miss. We do still have some rooms available for that weekend for B&B so if you fancy making a weekend of it, get in touch now to book a room so you can indulge in the stronger ciders without worrying about getting home. Also bear in mind that Saturday 28th October will be our Family Hallowe’en Party at 4pm so you can bring the whole family down to the pub, and enjoy party games AND cider and sausages all at the same time. Tickets for the Hallowe’en Party are £5 per child. And Sunday 29th we have live music with Steven Faulkner from 5pm, the perfect way to round off a weekend of cider drinking and sausage eating. 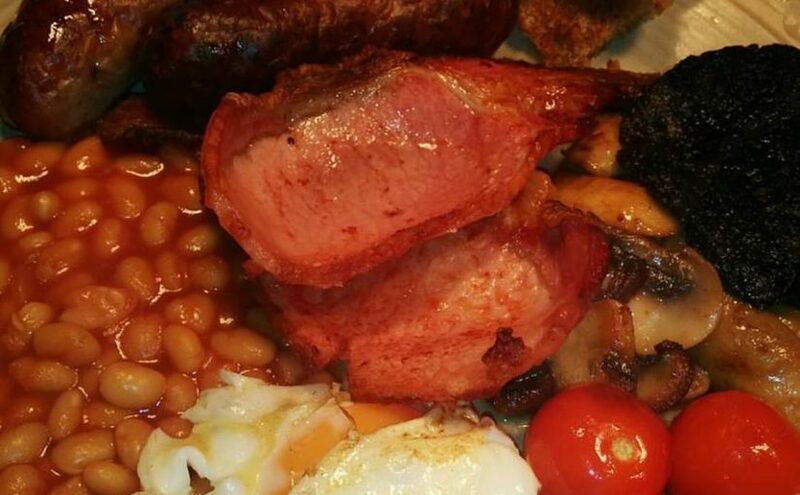 Who doesn’t love a nice big fry-up on a Saturday morning when you’ve been out on the … umm … town the night before? The only problem with a slap-up breakfast on a Saturday is sometimes it just takes you a little bit longer to get ready. We’ve got you covered, though. 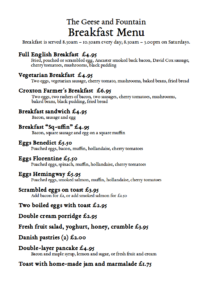 The Geese and Fountain now serves breakfast from 8.30am until 3.00pm every Saturday! 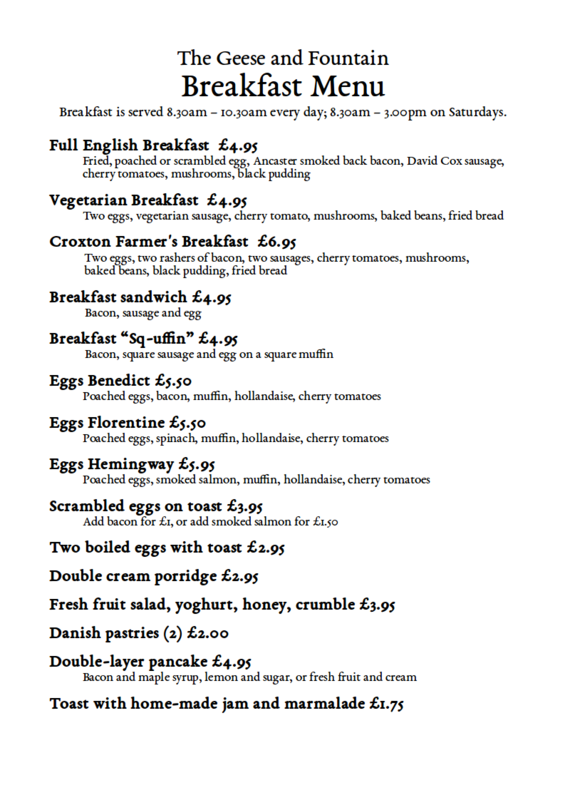 With traditional Full English, our legendary Croxton Farmer’s Breakfast, Eggs Benedict, and even healthy options like fresh fruit or porridge, there’s a breakfast for everyone. Through the week we know people have stuff to get on with, and so do we, so that’s why we serve breakfast only until 10.30am, but on a Saturday, you can take your time. The sausages will wait.